For nearly 15 years, O. Jean Renick made annual gifts to a scholarship fund in the Virginia Commonwealth University School of the Arts. 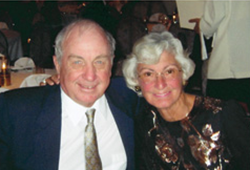 The Charles Renick Scholarship held special meaning for her. In 1985, friends and alumni created the scholarship when Renick's brother, Charles, retired from the school's sculpture department. Charles Renick, who earned his bachelor's and master's from VCU, served 32 years as a professor and two-time department chair. He passed away in 1987. In 1995, Jean Renick started making annual donations to the fund on behalf of her family, contributing more than $50,000. Her will included a bequest to the School of Arts, designating $20,000 to the scholarship. "Thanks to Jean's generosity, the Renick legacy will live on in a meaningful way for many students in the future," said Connie Brown, alumni coordinator for the sculpture department. The Charles Renick Scholarship was awarded to junior Conor Backman and senior Michael Muelhaupt, who each received $1,500 toward their tuition for the 2009 fall semester. Muelhaupt, who works full time in the sculpture department's woodshop while pursuing his degree, is grateful for the award. "Making art can be expensive," he said. "It's important for students to have the ability to create art without the financial stress." Bequests are a wonderful way to not only augment existing scholarships but also to honor the memory of a loved one.